Real Jeep enthusiasts take delight in knowing that their vehicle isn't just for the paved highways and busy main streets that most drivers travel every day. These Jeep drivers look forward to excursions on the rugged terrain off the road. But that terrain can do a number on essential components of the vehicle, which is why skid plates available from JustforJeeps.com are a great idea to protect your late model Grand Cherokee from whatever debris kicks up on your next (off-)road trip. The skid plates are made from heavy-gauge steel to fortify their effectiveness. Each skid plate is sold separately. Please choose skid plate above. Very easy 4 bolt installation. Although the skid plate came with an installation package of 4 bolts and accompanying clips; they weren't all necessary as the 2015 Grand Cherokee had welded nuts in place and I just used them in place of the clips. I also reused two of the factory bolts. Although somewhat awkward for one person installation; it was doable as a couple of the mounting points were slotted so those were put in place first prior to the remaining two holes so balance wasn't that difficult. ProsGives me peace of mind when driving in deep snow knowing that the skid plate is protecting critical parts from hidden rocks. There is a large hole to allow draining the engine oil. These are heavy duty steel plates, which offer great protection to critical parts under your Grand Cherokee. 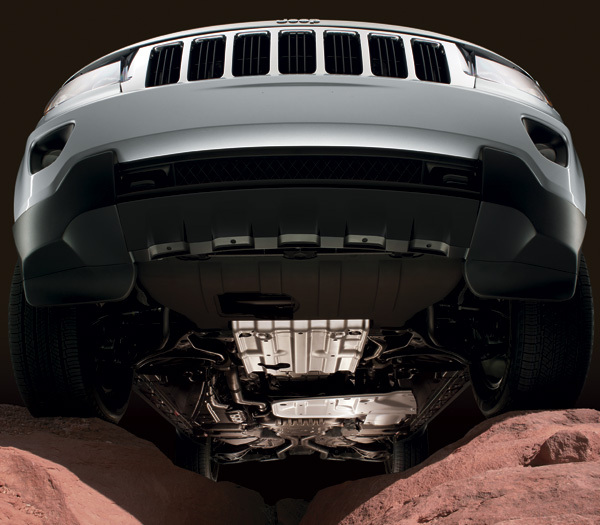 Not a big necessity, unless you are planning to take your vehicle off road where rocks or fallen tree branches can pose a risk to its underside, especially considering the plastic-made fuel tanks. Easy to install, but may require a second pair of hands to handle the heavy plates into position. JustforJeeps is easy to work with and I received my order the next day.